I'm very excited about this weekend because I finally get to go shopping. I haven't bought anything new in weeks because I've been saving for a vintage road trip in September, so this weekend I get to go to my two favorite vintage shops. It's not vintage in any way, but it has a very timeless, classic feel. The costumes, sets, story, everything about Amelie makes me smile! It's the ultimate feel-good movie and I just love that. When I first watched it, I couldn't take my eyes off the screen. As soon as Pj got home from work, I had to re-start it so he could watch it too. We stayed up past midnight watching it and of course, he fell in love. I think what I love most about Amelie is that the movie focuses on a lot of common day-to-day topics but makes them seem so wonderful. Its one of those movies that makes you stop and appreciate all of the little things in life. She dislikes when people talk on the phone in the check-out line and ignore their cashier. She also dislikes hair in the drain of the bath tub and the sticky, hard crunch of peanut brittle. She likes to peel off her nail polish. She also likes to watch people in their cars because they don't think anyone can see them, she likes the garlic scent of her neighbor cooking Indian food." Amelie lives alone in a small apartment and is a waitress at a local cafe. As a child, she was sheltered from the world my her father and lives in her own little world. When she grows up, she finds interest in observing the relationships of people around her. Whens he finds a strange box of hidden treasures in the wall of her bathroom, she is determined to return the box to its owner. When she sees how touched the man is, she changes the lives of everyone around her by seeing to it that they are happy. One day outside of a photo booth, she sees a strange young man collecting torn up photos of strangers. 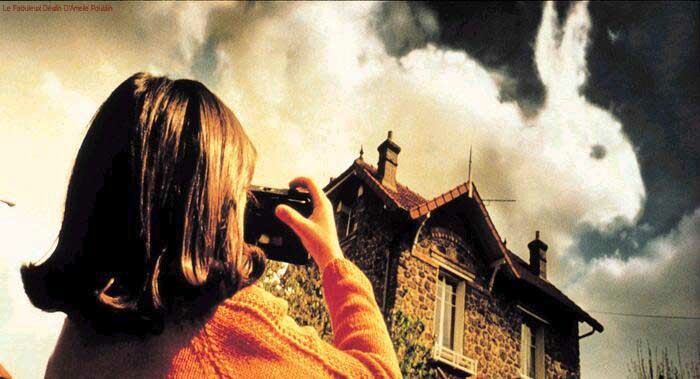 When he runs away and leaves his album of strangers behind, Amelie tries to solve the mystery of the identity of the owner of the album and the man in many of the pictures. The beautiful costumes for Amelie were designed by Madeline Fontaine and Emma Lebail. I love Amelie's unique style. She wears a lot of cardigans, lacy tops, skirts and long coats. The colors of her wardrobe are so rich and lovely. This fall, we can all pull a little fashion inspiration from Amelie. I enjoyed this movie. It was very Indy, quirky and had a unique style all it's own. The fashions were wonderful too! One of the best romance movies of all time! I love it so much. I have been meaning to check out Audrey Tatou as Coco Chanel. Have you seen that? I love the outfit pictures you show. The fashions for that movie were (of course) uh-mazing!! *sigh* I love this movie! Ever since I watched for the first time... egads, forever ago, I have always wanted a kitchen like hers! Plus, I have never been able to get over how cute she is in that short hairstyle, or by how much she can do with it! Love love this movie. I will watch it over and over. You should check out some of his other movies. All have amazing cinematography and audrey tatou's in some of them too. i want one of each !!! This is on my Netflix instant que. I need to get on to watching it finally. How awesome are these Friday Night posts?! 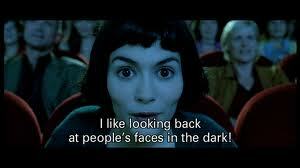 I love Amelie too, it's a visual spectactular for sure!